The Dorn Method is an extremely valuable skill for all Complementary therapists. It is a gentle manual therapy designed to help alleviate the causes of common Back and Joint pain, developed in Germany over 40 years ago by the late Dieter Dorn. Click here to discover why learning the Dorn Method could be for you. 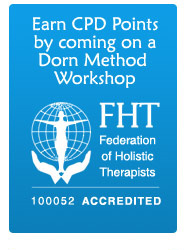 In the UK these Dorn Method workshops are accredited by the FHT, which is a major professional body representing Complementary Therapists. Therapy for people with Back Pain is in demand, and because Dorn is very easy to learn without long or expensive courses it is the ideal skill for all Complementary Therapists and Healthcare Professionals. The Dorn Method must be one of the lowest cost Back and Joint pain therapies you will find to study, with only a short weekend course required for all the essential skills. Additionally a weekend Dorn Method course is one of the best ways for Therapists to gain CPD points. If you'd like to consider learning this very valuable skill, please follow this link to read more about Dorn Method Workshops. 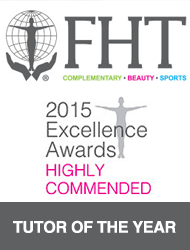 FHT Excellence Awards - Highly Commended Tutor of the Year Award! Dorn Haus arrives in Stratford upon Avon! 50th Workshop which was held in London! Congratulations to the 300th Dorn Student! I've been busy trying to spread the word about Dorn and have written a few articles which were published in various magazines. I've also got copies of them at this website for you to read here. Developed in Germany nearly 40 years ago, The Dorn Method is growing in popularity all over the UK and around the world! The Dorn Method consists of safe and gentle techniques developed in Germany and used for nearly 40 years. It is growing in popularity and can now be found in many countries of the world including the USA, Hong Kong, Philippines, Australia, Germany, Austria, Switzerland, Africa, the Middle East and others. In the UK today Therapists are springing up in all areas offering Dorn as a Complementary Therapy working aside orthodox medicine. Rather than remaining passive, Clients work together with the Dorn Therapist at all times using dynamic techniques designed to help vertebrae and joints slip more easily back into their natural positions without using any heavy force or thrust moves. You can learn more about the basic principles of this fascinating and wonderful therapy by following this link: how the Dorn Method works. A question I often get asked by Therapists is: where can I get insurance to cover me when treating Dorn? I'm really pleased to say that more and more companies are now offering Insurance for The Dorn Method in the UK, including the FHT. To help you, I've added a list of companies I've found on my links page. If you would like to keep in touch with the world of The Dorn Method, what trainings and get-togethers I am planning, as well as exciting Dorn hints, tips and techniques, please sign up for my email newsletter here. The first Dorn Method book written in English! Featuring all Dorn Method self help excercises, techniques and more; download it today. Follow this link for more details: Dorn Method eBook.